Turquoise is a stone that has been valued by humans for thousands of years. Native Americans appreciated this stone for its natural beauty and for its mythical power. It was used in ancient Egypt at least 3000 years ago. Important buildings in middle eastern cultures had domes and walls covered with turquoise. The Chinese, Greeks, Indians, and Turks all prized this pale blue stone. Turquoise is formed as a secondary mineral. 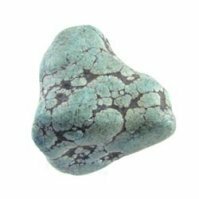 This means that the minerals (copper, phosphate, and aluminum) that make up the turquoise were part of another mineral or group of minerals before they came together in this form. It is found in arid climates often forming in cavities of volcanic rocks. Classed as a phosphate the chemical formula is CuAl6(PO4)4(OH)8 4H2O a hydrous phosphate of copper and Aluminum. This cryptocrystalline mineral is relatively soft compared to other precious stones about 5-7 on the Mohs scale. The best stones for jewelry and other decorative objects are those on the harder end of the scale. Turquoise has a wide range of shades through the blues and greens. Notable deposits of turquoise are found in Iran, Sinai, and the southwestern part of the United States. Location: Iran, Sinai, and the southwestern part of the United States.